As part of the September Training Intensive in Tucson, AZ, we are excited to welcome the leader of Axé Capoeira Arizona, Contra-Mestre Camara to teach a workshop at Axé Capoeira Tucson – STUDIO AXÉ on Saturday, September 16. 2017. Jay Spain, or Contra-Mestre (CM) Camará, was born and raised in New York City. As a youth and young man Jay was drawn to all forms of martial arts. He has studied countless forms, and is also a Sifu in Wing Chun. As a curious young martial artist Jay encountered Capoeira in US very early as it began to spread outside of Brazil. He immediately became drawn to the art form and fell in love with the footwork and movement. However, it wasn’t until 1992 in Vancouver, British Columbia, Canada, that Jay met Mestre Barrão and became his first student in North America. He quickly earned the nickname “Camará” which means friend in Portuguese. 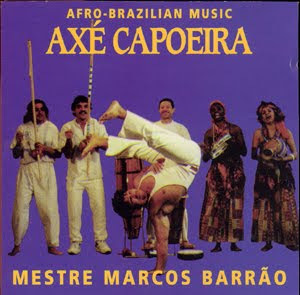 Camará was an influence in Mestre Barrão’s decision to stay in Vancouver and create Grupo Axé Capoeira as it is today. Today CM Camará is a highly valued teacher in Grupo Axé Capoeira. In the year 2000 he began teaching Capoeira in Tempe, Arizona. And in 2003, Axé Capoeira Arizona opened the first Capoeira Academy and Dance Cultural Center in the Valley. As head teacher of Axé Capoeira Arizona, CM Camará has developed and implemented the kids, teens and adult curriculum to provide everyone with an alternative mean to develop confidence, encourage health and fitness, and to promote cultural awareness and experiences through Capoeira. It is through CM Camara’s teachings and mentorship that Instrutor Sombra, the founder and leader of Axé Capoeira Tucson, continues his journey of capoeira and now works to provide a safe and encouraging environment for the community to enrich their lives through the practice of capoeira, martial arts, and fitness. If you’re interested in joining us for this FREE capoeira event, RSVP via the facebook event here or, fill out the CONTACT FORM here to reserve your spot.